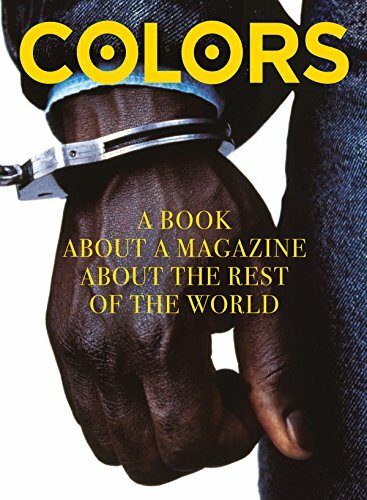 I remember the first issue of Colors back in 1991, certainly a different looking magazine, big photos (and frequently over enlarged) exuberant page design and articles that had a unique perspective on life around the world. It was funded though by the deep pockets of clothing manufacturer Benetton which allowed writer Oliviero Toscani and designer Tibor Kalman to do their own thing without the constraints that other publication live with. This large size book is a celebration of ninety issues of the magazine but I found the contents as scattershot as some copies of the magazine I had seen. The pages are a collection of reproductions of spreads from past issues which means that some of the text isn't readable or some of the copy has been reset and used with pictures from the original articles. There are ten themed chapters (plus two interviews at the start of the book with Toscani and Luciano Benetton) but they are very loosely based on their subject. The one called Elvis meanders around all sorts of items with very little to do with a dead rock 'n roll star. The one that seems the most obvious is Bang, which looks at various types of guns and explosive from around the globe. This could have been a worthwhile look back at ninety issues if only the Editors has presented the material in a more thoughtful way that would make sense to the reader. I always thought the Color's covers were interesting but there isn't even a spread or two showing all of them since 1991, the nearest you'll get to that is photo on page seventeen showing all of them in one pile with the spines facing the camera.